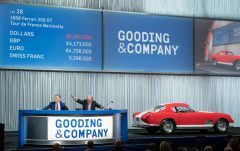 Barrett-Jackson’s top results at the Scottsdale 2018 collector car auctions included a 2017 Ford GT and two new Chevrolet Corvettes sold for charity while a Porsche 918 Spyder and 1952 Ferrari 212 Europa also achieved over a million dollar. The top result at the Barrett-Jackson Scottsdale 2018 sale was $2,500,000 paid for a 2017 Ford GT that was sold to benefit autism charities. A 2015 Porsche 918 sold for $1,430,000 while the third highest result was $1,400,000 for a 2018 Chevrolet Corvette sold for charity. A 1952 Ferrari 212 Europa achieved $1,100,000 while the same was paid for a 1965 Chevrolet Corvette Cutaway demonstration show model. 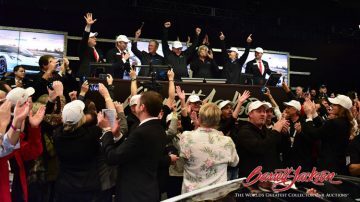 Barrett-Jackson raised $6.21 million for charity at the Scottsdale 2018 sales. Barrett-Jackson held its 47th Annual Scottsdale Auction of collectors cars and automobilia on January 13-21, 2018, at WestWorld of Scottsdale. 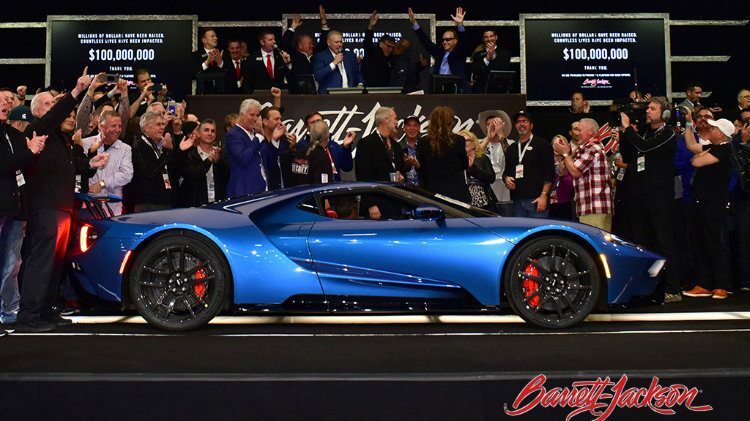 The top result at the Barrett-Jackson Scottsdale 2018 sales was $2,500,000 paid for a brand-new, rare Liquid Blue 2017 Ford GT. The car was donated by Ron Pratte to the Evernham Family-Racing for a Reason Foundation to benefit the Autism Society of North Carolina’s IGNITE program. This was the top result at Barrett-Jackson and the eighth highest price paid for any car at the Scottsdale 2018 sale and at any car auction thus far in 2018. The second highest charity lot result, and the third highest overall at Barrett-Jackson Scottsdale 2018, was $1,400,000 paid for a 2018 Chevrolet Corvette Carbon 65 Edition. Only 650 of these special edition Corvettes were produced with this car donated by General Motors for the George W. Bush Presidential Center’s Military Service Initiative. 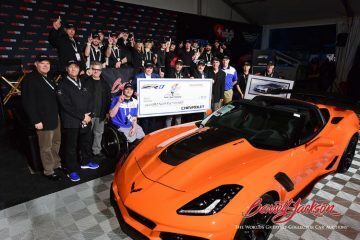 A 2019 Chevrolet Corvette ZR1 sold for $925,000 to benefit the Building for America’s Bravest Through the Stephen Siller Tunnel to Towers Foundation / Building for America’s Bravest. This Corvette, also donated by General Motors, is the first retail production VIN 001 2019 Corvette ZR1. 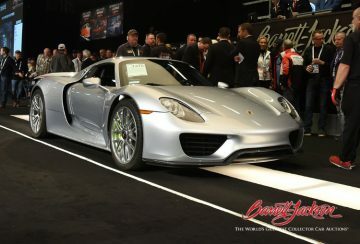 The top non-charity result at the Barrett-Jackson Scottsdale 2018 collector car auctions was $1,430,000 paid for a 2015 Porsche 918 Spyder. This 918 has covered a relatively high 3,487 miles. Prices for 918 Spyders have been noticeable weaker at Scottsdale 2018 compared to result achieved in 2017. Bonhams sold one for $1.3 million while a 100-mile car at Gooding failed to sell with a highest bid of $1.55 million. 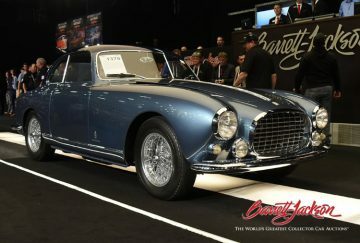 Barrett-Jackson sold a 1952 Ferrari 212 Europa for $1,100,000. This car is one of only 11 Ferrari 212 coupes produced by Pinin Farina and was Ferrari’s official Turin Motor Show car in 1953. The restored Ferrari 212 Europa boasts multiple class wins and platinum awards, including Best in Show at Cavallino Classic, Best in Class at the International Ferrari Concours Monterey, Best in Class and a perfect 100-point score at Pebble Beach Concours. A 1965 Chevrolet Corvette Cutaway Coupe sold for $1,100,000. 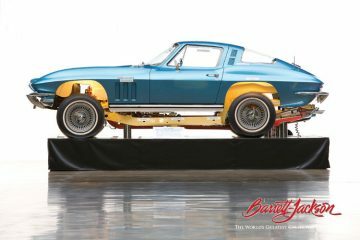 This show model started life as a proper road-going 1965 Corvette Stingray before being converted into a special demonstration stand. It was used at various shows to demonstrate the hidden mechanical component of the car. 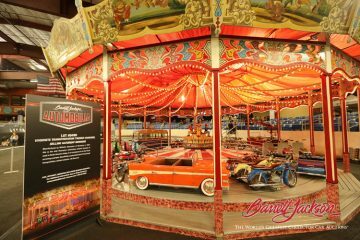 A superb $557,750 was achieved on a full size transportation-themed carousel manufactured by Wilhelm Hennecke in 1957. Only five of these carousels were imported from Germany into northern America and this one is considered the finest surviving example. It is still fully functional and includes 27 hand-built transportation related vehicles. Barrett-Jacksons next major auction is in Palm Beach in mid April 2018.